With the detailed set of measurements I took in day one of Custom Pattern Cutting and Fitting, day two was spent drafting a bodice block from those measurements. 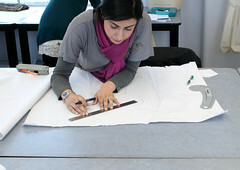 The block is a representation of the shape of the body on paper, which is traced to make patterns. This starts life drawn on paper as a rectangle, the height of the torso and half the width of the torso circumference at the widest point. 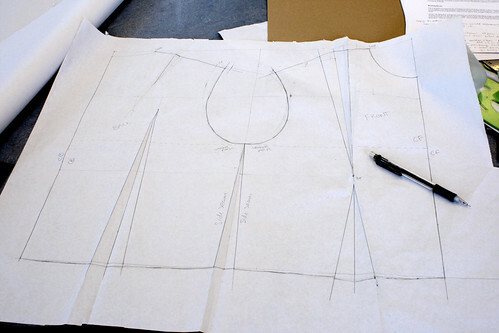 It is divided to create front and back, then bust darts added, slope of shoulder accounted for, neckline and sleeve openings drawn, all positioned using a combination of body measurements and rules of thumb. I’m not going to describe how this is done – there are plenty of books available, such as Pattern Cutting and Making Up: The Professional Approach . If have one one criticism of the course at LCF it’s that the handouts were confusing and ambiguously worded. I had trouble following the instructions the second, third and forth times on my own, so I’ll probably invest in that one myself. Woohoo! This looks seriously intriguing (love the suggestion re tailoring influence on knitted pattern shaping! ), can’t wait to see more!